Florentijn Hofman’s popular Rubber Duck installation piece, known to visit the water of cities across the globe like Sydney, Hong Kong, and most recently at Los Angeles, has popped up this time at Seokchon Lake in Seoul, South Korea! 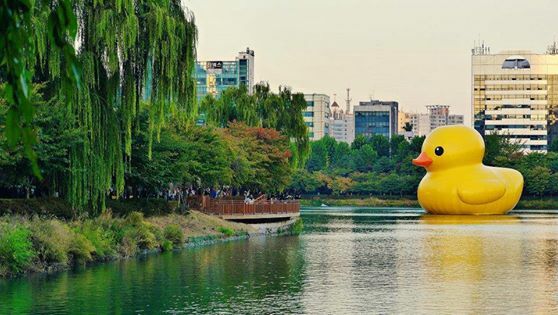 The giant 54′ duck appeared in Seoul this past week, and is scheduled to remain there until November 14th. The duck’s debut attracted over 720,000 visitors last Tuesday, wooing crowds with its giant adorable charm. Pop-up stores across Seoul debuted alongside the arrival of the Rubber Duck, and carried 5000 limited-edition reproductions of the art piece, each signed and numbered by Florentijn himself. Once the installation leaves Seoul on November 14th, the Rubber Duck will surely appear in another international location, so stay tuned for more information! Florentijn Hofman’s Rubber Duck recently departed from Los Angeles docks after a popular series of events following the Tall Ships Festival, but the Dutch artist shows no signs of slowing down as he has unveiled a brand-new inflatable art piece at London’s famous River Thames! Titled the HippopoThames, the new sculpture is over 68 feet long, and was created to commemorate the Totally Thames Festival which will take place at locations through the River Thames for the rest of September. 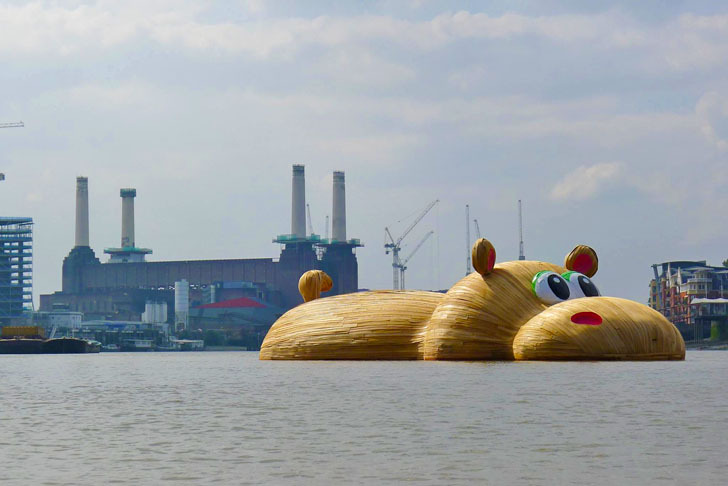 Hofman’s HippopoThames is based on prehistoric hippos that used to inhabit the River Thames, and is scheduled to be displayed at the Nine Elms distcit in London until its departure on September 28th. 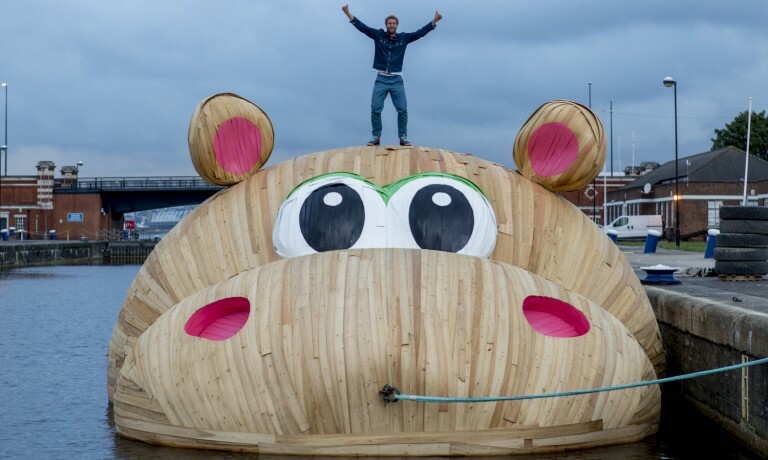 Although there have been no announced plans on if the HippopoThames will visit other locations along the river or even worldwide, Hofman will surely be debuting more art pieces across the world in the neat future. 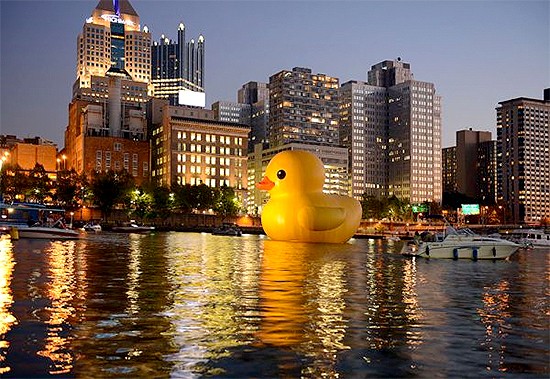 The Rubber Duck, a floating installation piece by Dutch artist Florentijn Hofman, has been traveling the world for the past couple of years, showing up in locations like Taiwan, Osaka, Hong Kong, Sydney, and the United States. In a continuation of this giant 54′ tall inflatable bird’s quest across the globe, the Rubber Duck made its debut appearance last week in Los Angeles! 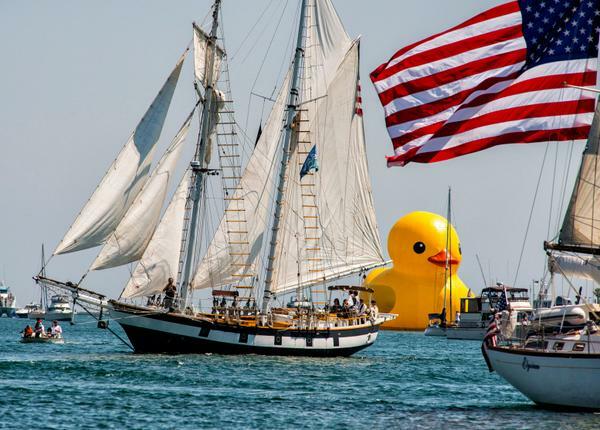 The Rubber Duck was a star attraction in Los Angeles’ Tall Ships Festival, which lasted from August 20th to the 24th, and attracted a lot of media attention as well as admiration from spectators and fans. The duck, which was originally intended to leave the harbor following the end of the Tall Ships Festival, made such a huge splash with spectators and fans that city officials have decided to keep the Rubber Duck on display at the Port of Los Angeles until September 6th! Events have also been planned alongside the duck’s extended stay at the port, including photo ops, dress-up events, and more! 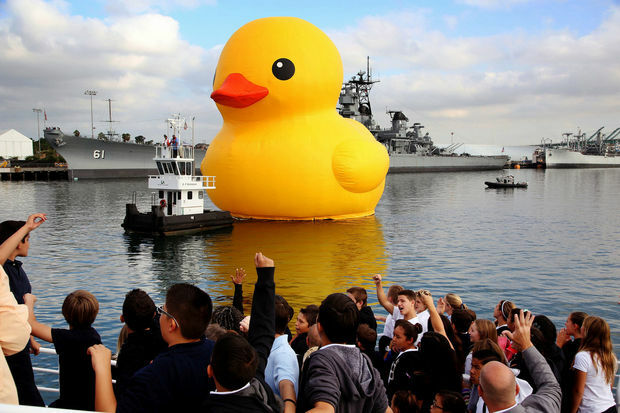 The Rubber Duck is now scheduled to leave the Port of Los Angeles on September 6th, so make sure to stop by if you can! Dutch artist Florentijn Hofman’s popular Rubber Duck sculpture has seen a variety of locations all over the world. Ranging from locations like Beijing, Sao Paulo, Sydney, Osaka, Hong Kong, and more, this giant 54′ tall inflatable bird has traveled worldwide and mesmerized citizens in all different countries. Now, Hofman’s Rubber Duck will come to the United States for a second time, resting its wings at the Chrysler Museum of Art in Hampton, Virginia. The Rubber Duck will be part of the museum’s reopening ceremony on May 10th, and will remain at the museum until May 26th. Following the popular appearance of the bird in Pittsburgh, Pennsylvania in 2013, this upcoming appearance is anticipated to be a huge hit by both the museum and fans across the nation. With even more destinations planned in the future for the Rubber Duck, it might just end up closer than you’d expect!